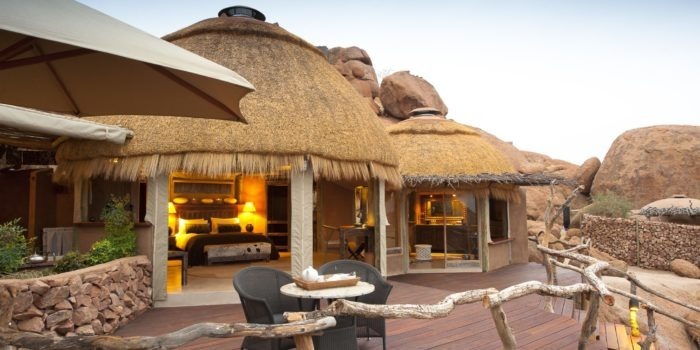 A luxurious lodge in the natural setting of the Erongo Mountains, where desert, mountains and bushveld meet. 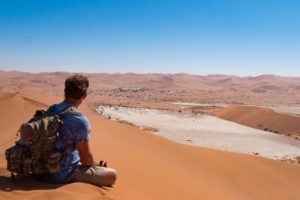 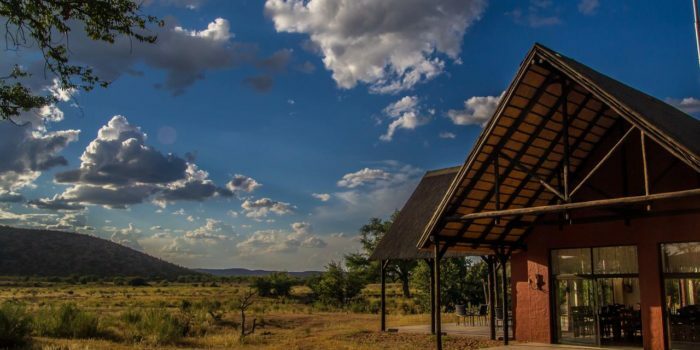 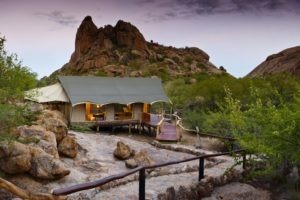 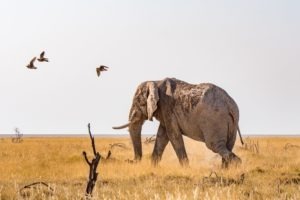 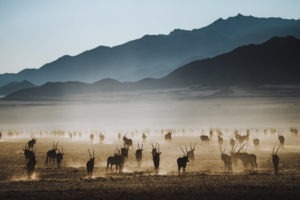 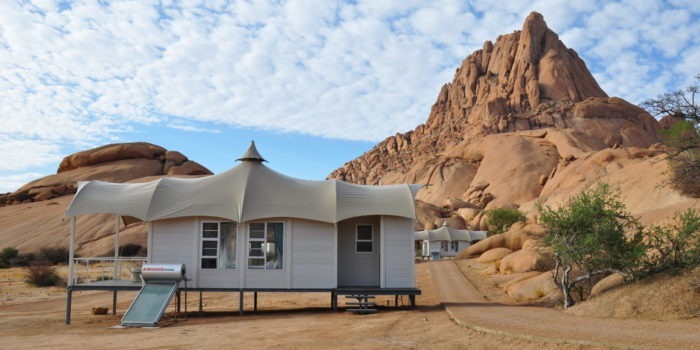 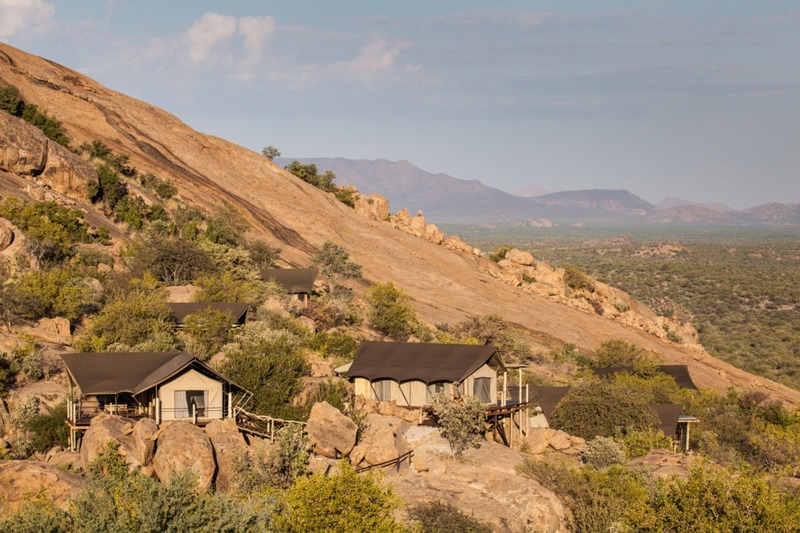 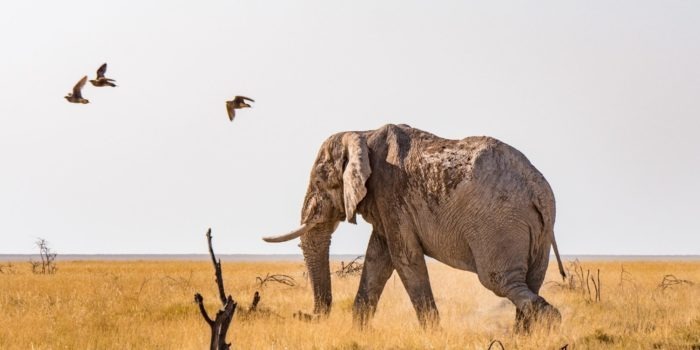 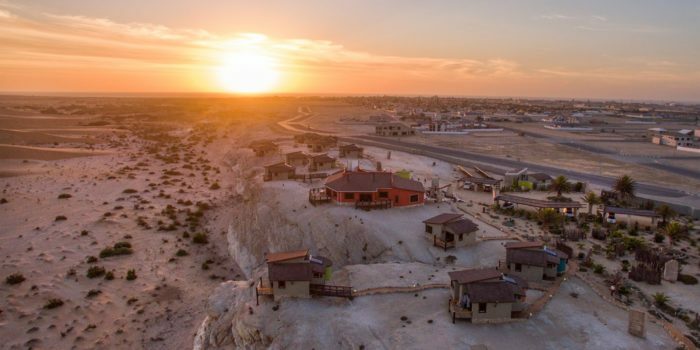 Erongo Wilderness Loge offers a diverse environment, luxury within a lovely natural setting and excellent activities – a true paradise for nature lovers! 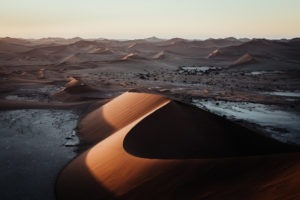 The circular massif of Erongo Mountains is an eroded relic of a volcano that was active 150 million years ago. 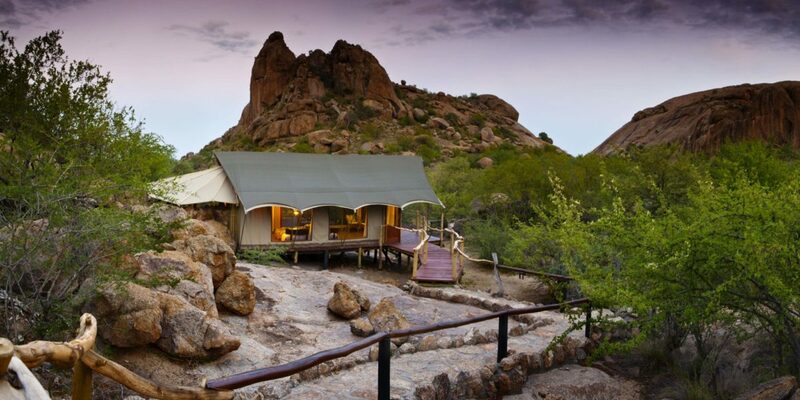 Erongo Wilderness Lodge is located within the 200 000-hectare Erongo Mountain Nature Conservancy, an area created to protect and conserve this unique wilderness with its animals, flora and fauna. 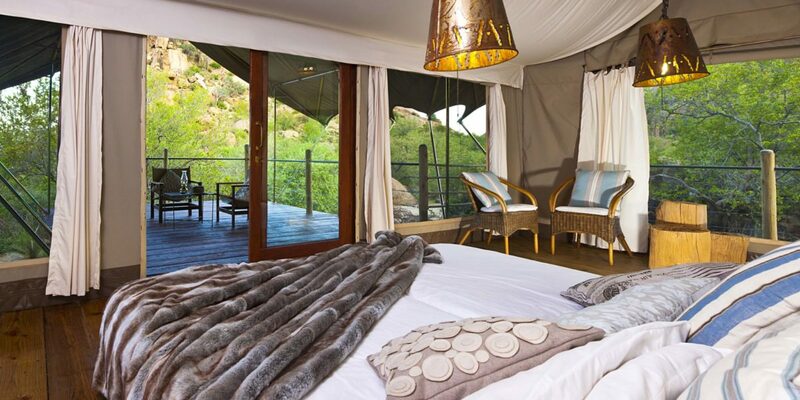 The lodge’s 10 luxury tented chalets are built on stilts and are surrounded by rocks and set on the side of the mountain offering a maximum of privacy and tranquillity. 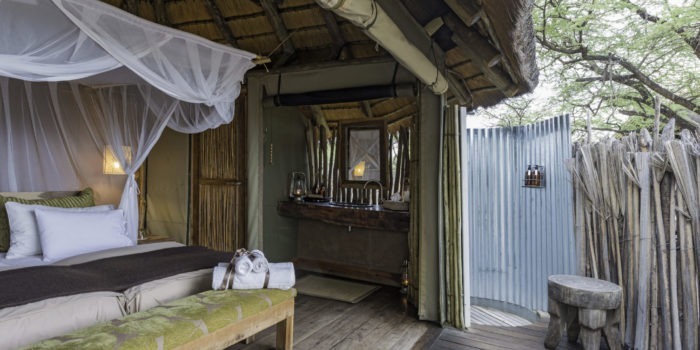 The design of the rooms is simple yet elegant and perfectly blending in into the wild surroundings by using natural colours and fabrics. 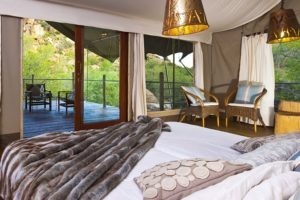 Each room has an en-suite bathroom at the back with a shower integrated into the existing rocks and trees. 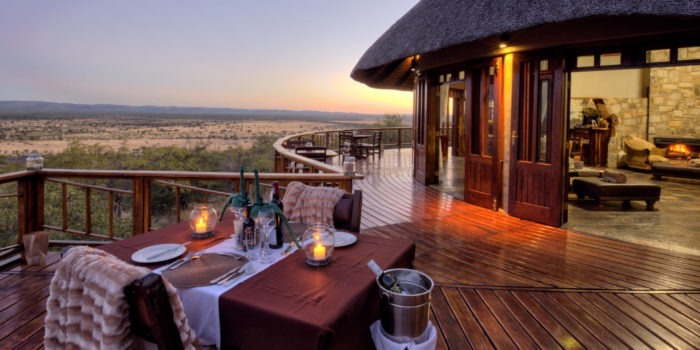 The private veranda at the front offers phenomenal views over the diverse landscape of the Erongo Mountains and it is truly magical seeing the sun set over the mountain. 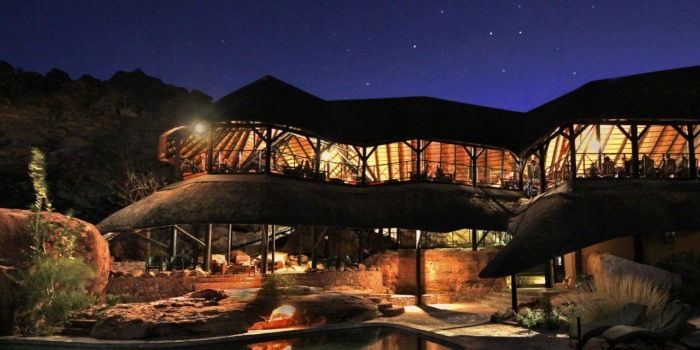 The main area located atop a hill offers the restaurant and a lounge area, all overlooking a floodlit watering hole. 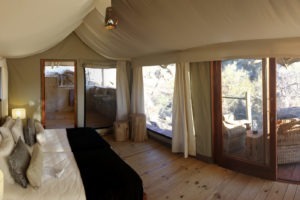 Guests can cool off in the natural-style pool or cozy up by the central fireplace. 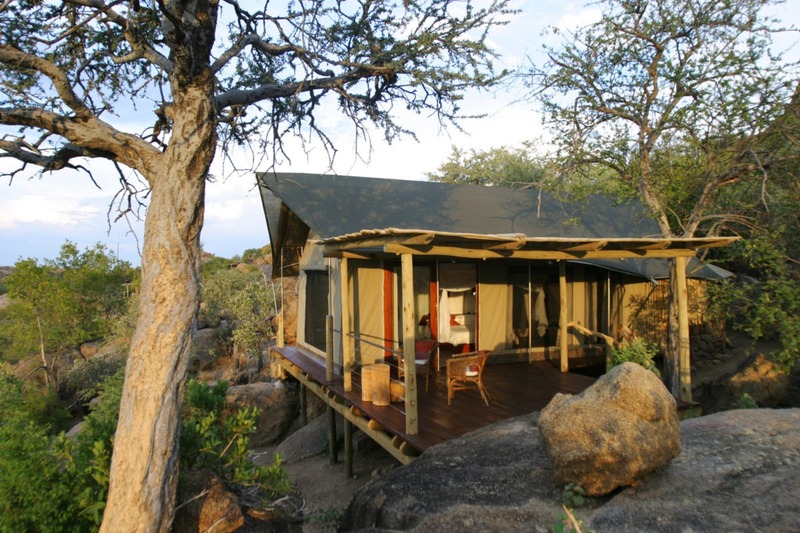 The offered activities mainly focus on walking, enabling guests to explore nature in every small detail. 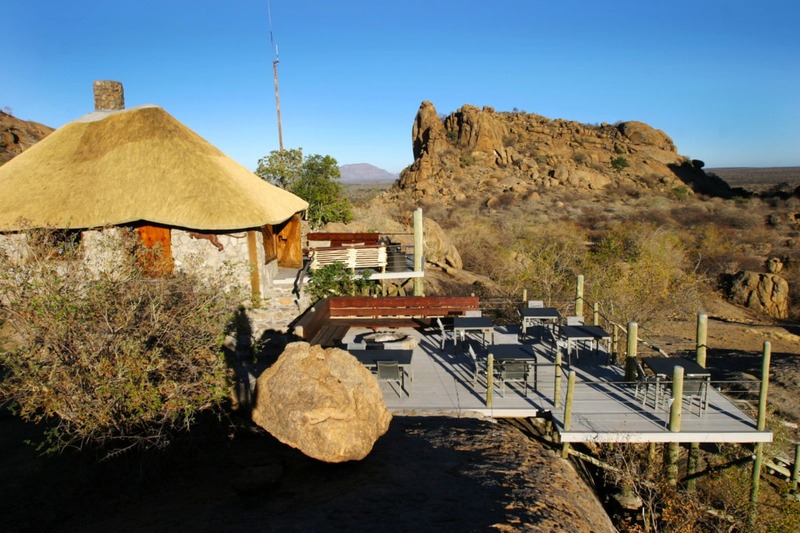 Take a self-guided walking trail or join one of the lodge’s knowledgeable guides to get a greater sense and understanding for the biodiversity of the Erongo Mountains. 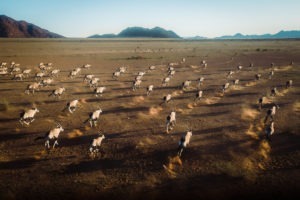 Afternoon drives offer chances to see animals like oryx, kudu or Hartmann’s mountain zebra. 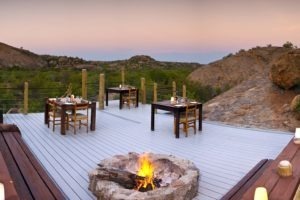 The area is also well known amongst birders, as numerous species are domiciled in this unique environment, including the rosy-faced lovebird, white-tailed shrike and the freckled nightjar. Another must see is the region’s ancient bushman rock art, which can be experienced on a visit to Paula’s Cave. 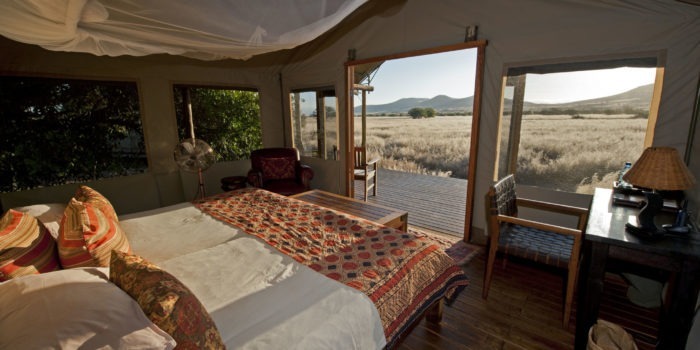 A special wilderness area offering diverse nature – well known amongst birders. 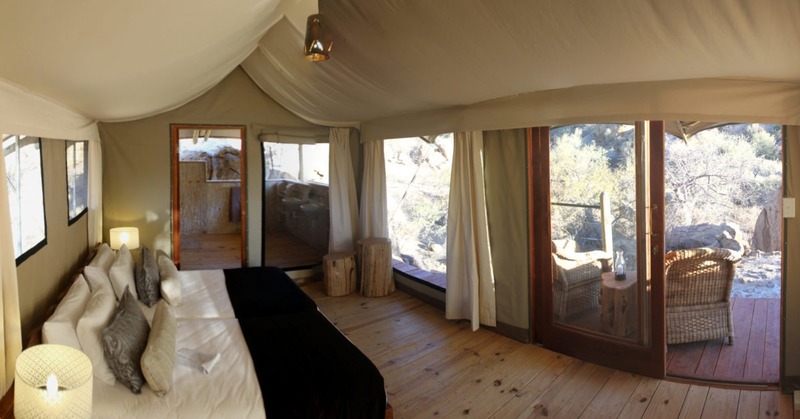 Unique lodge with a luxurious yet natural atmosphere, located in a Nature Conservancy. 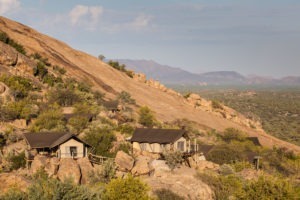 Tented chalets among the boulders on the side of the mountain with lots of seclusion and privacy. 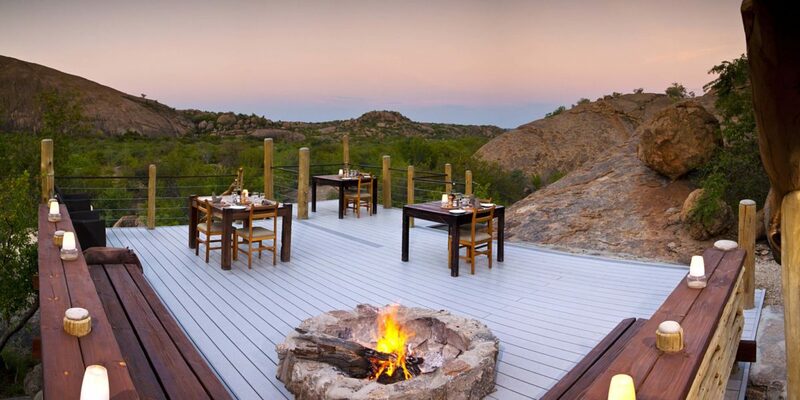 Private chalet deck offering unforgettable views and a perfect sundowner-spot. 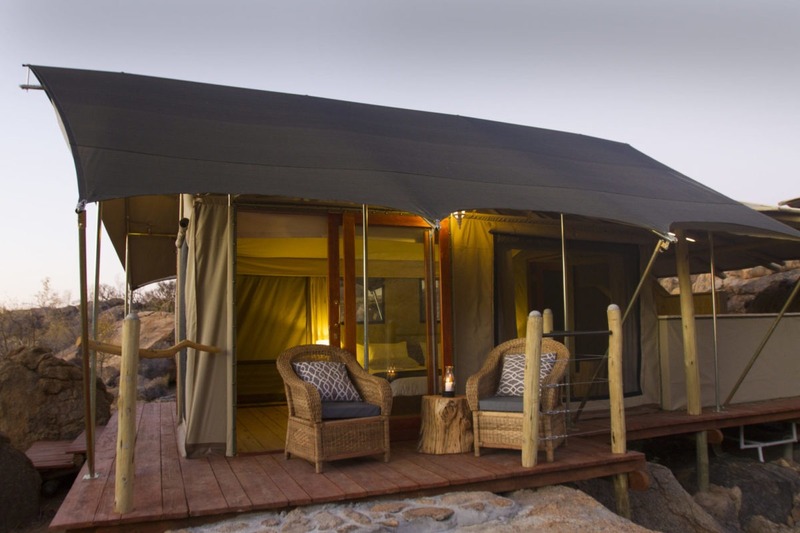 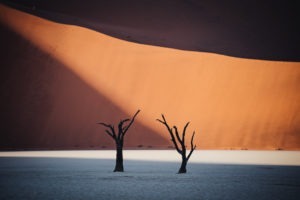 Activities that enable guests to explore this wilderness in great detail.